Incredible offer of a complete Crucianelli accordion midi kit – everything you need right down to the music stand. 1. 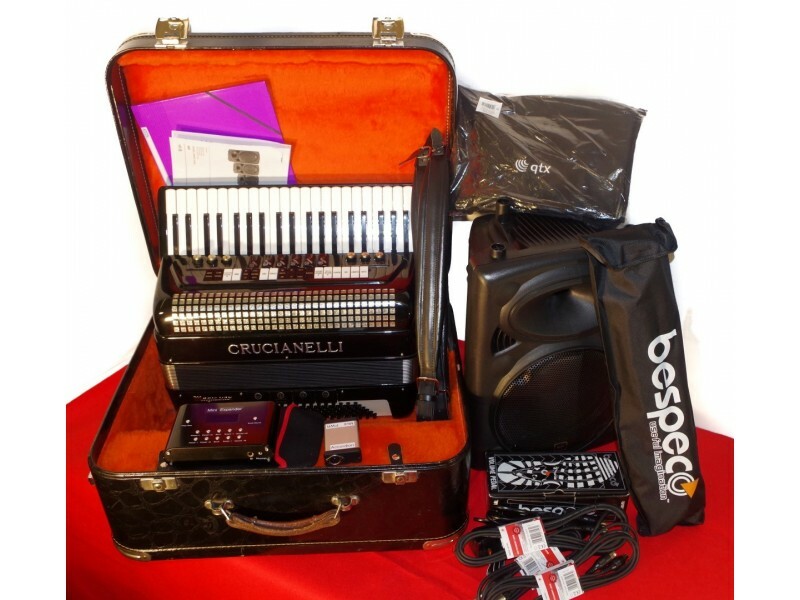 Top brand Crucianelli Scottish tuned accordion with superb latest contactless midi system with all of the switches on the accordion setting different midi sounds. 2. Accordion case with special pocket to hold all of the accessories (except speaker and music stand). 4. New Bespeco quality volume pedal. 5. New speaker amplifier with microphone and line inputs, titanium driver, carry handle. 6. New speaker cover with embroidered name. 7. New Mini Sound Expander. 8. New transformers, connection leads. 9. New slip in pouch for sound expander. 10. New Bespeco quality music stand. Now is the time to take up midi with an entire kit for little more than the cost of the accordion – available separately for £1499 without the accessory kit! The accessories included in this kit total approximately £570! Renowned Full size Crucianelli 120 Bass midi accordion in good tune and order at a bargain price. Superb Scottish tuned reeds. Recent 2015 midi contactless system fitted and electret microphone system fully guaranteed. All switches operate in midi giving extreme ease of use. Great value full size MIDI accordion by Crucianelli. These Crucianelli accordions are noted for their good sound and with the added option of midi makes it an excellent performing instrument. This model features Scottish musette tuning 3 reeds in a line (MMM). 8 treble couplers for treble tone changes, 6 Bass couplers for bass tone changes give plenty of options including a cancel all reds setting if you want to play MIDI only. The MIDI system has 3 channels out for Treble, Bass and Chords. The system is fully serviced by us and guaranteed. All of the switches on the accordion work giving a huge number of sounds through a midi system. This is a new magnetic midi system and there is a full set of electret microphones fitted as well. 1: Plug the supplied Midi cable from the Midi socket on your accordion to the external box socket labelled Accordion. 2: Plug a standard Midi cable between the external box socket labelled Midi out and the expander. 3: Plug the supplied power adaptor into the PWR socket on the external box. 4: Plug a standard Jack cable between the Microphone socket on the accordion and your amplifier. Please note that the Microphones require power so make sure that you have the power and external box connected to the accordion if you plan to use the microphones. Your Midi is now ready to play. Your accordion has 18 switches on the treble grille. These operate as follows. These are split into 4 parts with the first 9 switches being for treble, the next 4 for chords, the next 3 for bass and the final 2 for a 2nd treble percussive part. The accordion will output treble, bass and chords all the time so that it works with any expander. The instruments switches just change the instrument on their part when they are switched on and are overridden by the next instrument change you make on that part. So if you switch the tab off it will still remain that instrument until you press a different one. i.e. the current instrument will always be the last one pressed on each part. The General potentiometer is for the volume of the treble. Flute, Clarinet, Sax, Trumpet, Strings, Kinura. These all change the treble instrument (channel 1) to the ascribed sound. Please make sure that your expander accepts program change messages to use these. On/Off – Turns off the treble part. The Chord potentiometer is for the volume of the chords. The Bass potentiometer is for the volume of the bass. The Percussion potentiometer is for the volume of the percussion. The percussive instruments are output on channel 4 so you must make sure that channel 4 is enabled on your expander. The microphone balance between left and right (bass and treble) is affected by the Tone potentiometer. The Volume of both parts is affected by the Volume potentiometer. Please note that the Microphones require power so make sure that you have the power and external box connected to the accordion if you plan to use the microphones.